Arab Emirates Bring Pagan War Goddess to UN - Breaking Israel News | Latest News. Biblical Perspective. The same multinational group that recreated the Palmyra Victory Arch and sent it on a world tour has now recreated a statue of Athena, the Greek goddess of war, for an exhibit in the United Nations, an organization that claims to be working towards world peace but which one rabbi likens to modern-day paganism. The United Arab Emirates (UAE) officially inaugurated the Digital Archaeology Exhibition, “The Spirit in the Stone”, at the United Nations’ headquarters in New York City last Thursday. The UAE, the Italian mission to the UN, and the Institute of Digital Archaeology (IDA) cooperated in re-creating a statue of the Greek goddess Athena for the exhibit. The original Athena statue stood in Palmyra, Syria, until it was destroyed by ISIS in 2015. The UAE announcement described the goddess as “synonymous with reason, refuge and the rule of law, all of the same values on which that historic institution was built,” but the statue depicts Athena in her classic pose grasping a spear, belying her prominent role as the Greek goddess of war. It is also believed that the Greek goddess Athena was based on the earlier Mesopotamian goddess Ashera and was later incorporated into early Islam as al-Lāt, worshipped in Saudi Arabia as the consort of Allah mentioned in the Koran. 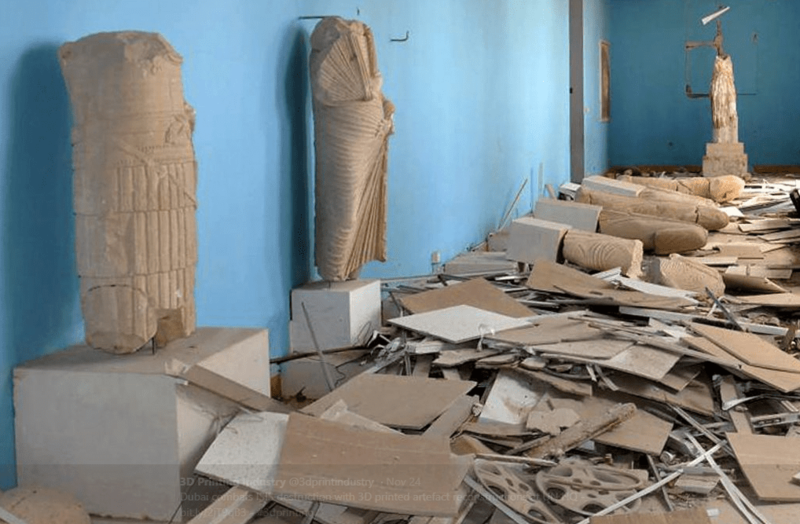 This would be consistent with the statue’s history at the site in Palmyra, which was used as a temple by the Mesopotamians, Romans, and Muslims in succession. Rabbi Elad Dokow, the head rabbi and lecturer at Israel’s Technion Institute of Technology, was not surprised that the United Nations would feature a display of pagan symbols. Though an initiative bringing together the Muslim-majority UAE with Italy to recreate a Greek pagan idol seems incongruous, just such a union was described in Jewish prophecy, first alluded to in Psalms. 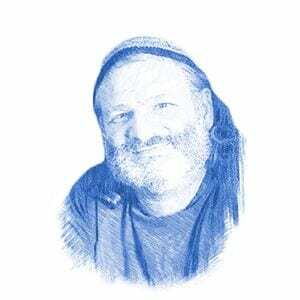 The first century Jewish sage Jonathan ben Uzziel described how this Biblical alliance between Ishmael and Esau would reappear in war at the End of Days. The UAE has worked with the IDA in the past. Their first collaboration, the 3-D printed Arch of Palmyra, was prominently featured in the UN exhibit as a full-size projection onto a screen. 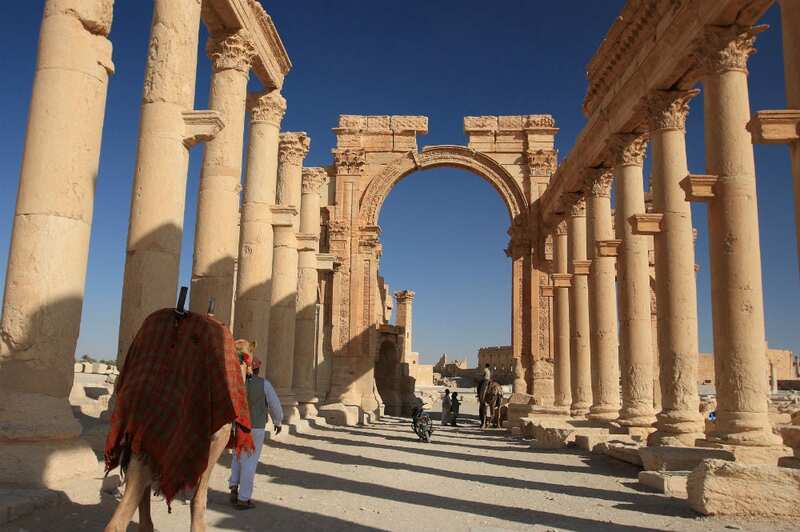 The original Arch of Palmyra was a Roman victory arch that stood for 1,800 years in front of the temple to the pagan god Ba’al in Palmyra until, like the statue of Athena, it was destroyed by ISIS. Ba’al was the form of idol worship frequently mentioned in the Bible as accompanying the worship of the female false goddess, Ashera. The reproduction of the Arch was first presented in April last year at London’s Trafalgar Square for the United Nations Educational, Scientific and Cultural Organization (UNESCO) World Heritage Week. The unveiling coincided with the most important pagan holiday of the year, Beltane, ushering in a 13-day period known in the occult as “the Blood Sacrifice to the Beast”, which was traditionally celebrated with child sacrifice and bisexual orgies. Similar to the current display of Athena at the UN, the Palmyra Arch was also displayed at events associated with a world government. It was the centerpiece of the World Government Summit in Dubai last February, and appeared in Sarona, Italy in June, its display intentionally coinciding with the the G7 Summit of world leaders. Editor’s note: This article incorrectly identified Athena as the Roman goddess of war. She is part of the Greek pantheon of gods, and was later associated with the Roman goddess of wisdom and war, Minerva.